ANI Technologies Pvt. Ltd., operating under the trade name Ola, is an Indian online transportation network company, founded as an online cab aggregator in Mumbai, but is now based out of Bangalore. Ola uses GPS to track the user’s current location & provides different types of cab service ranging from economic to luxury travel. The cabs are reserved through a mobile app supporting both cash & cashless payment options with Ola money. It also claims to clock an average of more than 150,000 bookings per day & commands 80 percent of the market share in India. 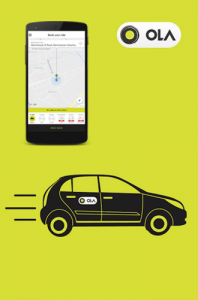 If we dig deep, Ola has two applications; one for the users and another for its drivers. An user, requests for a cab from his app whereas the driver gets notified of requests nearby his location. Once accepted, the driver picks the passenger up from his location & at the end of the ride, passenger pays for the ride. It really has changed the way urban India commutes. App Design: To achieve the users’ imagination & attention, intuitive & simple app design plays a critical role. App Platform (Android, iPhone): App development cost varies from platform to platform. App Size: This refers to the total number of features & functionalities that the app does have. One should always choose the features according to the target audience. Driver app includes features & functionalities such as: signup, sign in, access to the ride requested passenger name, image, ratings, distance, pick-up & drop-off points and a option to call the passenger via number-masking. Want to develop similar app like this?